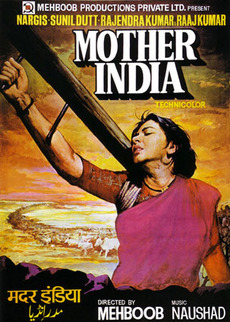 Welcome to the All-About-India.com list of the top 10 Bollywood Movies ever made! It's always feels like an impossibility when putting together one of these top 10 lists and I think none more so than a list of the top 10 Bollywood movies. With such a huge amounts of films both old and new, finding a list that everyone agrees on would require an as of yet unrealized mathematical equation, years of social and psychological studies and a slightly less passionate audience than those of the Indian majority; most of whom are more than happy to debate furiously into the early hours of the morning over the merits of putting this and that actor together, the varying qualities of different studios lip syncing techniques and the varying degrees of beauty amongst lead actresses. Yes, discussing anything to do with Bollywood usually turns out to be proverbial minefield so I consider myself brave taking on such a challenge as this where I put myself on the firing line in front of thousands of passionate movie goers. So please feel free to comment and moan about this list of the top 10 Bollywood Movies, never has the general population had such a platform to do so as the World-Wide-Web: Make the most of it! In the mean time I'll stick to my belief that "If it doesn't annoy anybody then there is no point in writing it!" In this 2007 portrayal of the 'world of growing up', Darsheel Safary plays an eight year old boy called Ishaan Awasthi who lives in a world full of wonders, colours and animals and clouds. When, after be packed off and sent to boarding school Ishaan learns that in the world of adults thing are not so bright and wonderful. The films follows his adjustment to this realization and the added issue of separation from his family. That is until Aamir Khan strolls in to town as Shankar Nikumbh who laughs in the face of conformity and fills the students with the joy and optimism that had been stripped from them through the process of growing up. It is through this medium that Ishaan slowly begins to rediscover himself and his true person is revealed. "How do you murder a man who has already committed suicide? The story written by Chandrakanth Patthi centers around 6 main characters who are all fighting over a life insurance policy worth Rs. 24 crores. A famous film director and his wife, a chauffeur, a confidante lawyer, a caretaker and an ACP spend the duration of the film trying to outwit each other in this very funny film. The story is fast paced and entertaining and is kept moving by the introduction of various different characters. Revolving around a wealthy and over-protective Business man (Kabir Bedi) and his two daughters, the film is set in Mumbai follows the tale of the the his eldest daughters (Sameera Reddy) love interests and potential husband - All under the eye of Mr Verma's deceitful business partner Mr Chopra. The film picks up speed as Ayesha (Sameera) is exposed to fast paced city life. The fascinating but sometimes difficult to watch film comes to a climax when with the meeting of the conniving Mr Chopra and the main love interest Ajay. An incredibly exciting and interesting film with an engaging plot and fantastic performances by all of the actors. A worthy entry into the list of top 10 Bollywood Movies. 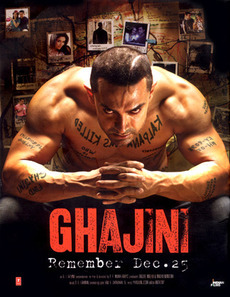 Aparantly inspired by the american film 'Memento', Ghajini has made it into this list of the top 10 Bollywood movies of all time mainly because of the sheer amount of money it trned over after its release. Based around the 'action/thriller' genre and sticking to the Bollywood rules of romance, villains and heroes the film follows the life of a rich businessman who inherits an accute form of amnesia through a violent scene in which his love interest, Kalpana was killed. The predictable bit comes now - The business man (Amir Khan) spends the remainder of the film trying to avenge his lovers, and his memories killers through the aid of tattoos and photos. Mildly predictable yet infinitely entertaining - a timeless classic. Produced by: Harish Amin, Allu Aravindand Madhu B. "The Indian 'Gone with the Wind'"
Often cited as the masterpiece of Bollywood cinema, it is in this list of the top 10 Bollywood movies for it's timeless ability to enthral viewers through it's moving portrayal of human suffering and struggle. The story is set deep in rural Indian and plays upon the relationship between a Mother (Nargis) and her interesting relationship with her sons, Birju and Ramu. Their hard life is made worse what with her husband being 'armless' and unwilling to leave the house and then the tragedy of the floods which destroy the village and claim the health of the son. A series of events then follow which delicately highlight many different aspects of human relationship, attitude, values and beliefs. A stunning emotional experience to say the least. 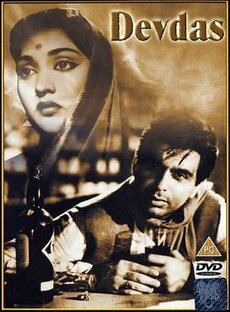 This classic from all the way back in 1955, this entry into the Bollywood top 10 movies has proven it's ability to withstand the test of time with many re-releases and remakes through out the ages; the most reason being in 2002. 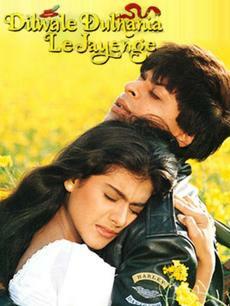 The films follows the story of two childhood sweethearts who originate in a small village. As the good friends grow-up their passion for each other emerges into full-blown love and all the bits that go with it; including marriage which brings in the other characters of the film, predominately Devdas's father who strongly disagrees with the idea of marriage. The couple are separated and other love interests introduced yet thier love for one another remains the same. Designed to tear you apart and then lift you up; 'Devdas' is a must watch film for all Bollywood fans. "He was a junior artiste. She was a star. For some dreams, one lifetime is not enough." 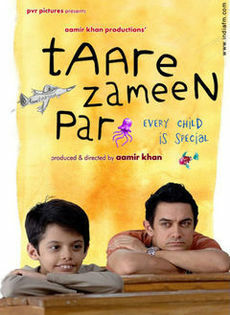 A seriously fun film for the family and in my opinion definetely one of the top 10 Bollywood movies. What first drew me to this film was 'The Independents' review that it was possibly one of the greatest love stories ever told. Quite a bold claim but upon viewing the film and then the statistics I understood their thinking. The film ran for an astounding 742 weeks in Indian cinemas - That figure alone warrants entry to this list of the top 10 Bollywood movies. What makes this film interesting is it's location, mainly in a rather damp and grey Britain. The story depicts a 'second century' couple living in London but still thoroughly attached to traditional Indian beliefs. The main essence of the plot covers Raj, a wealthy carefree soul, as he attempts to convince the members of Simran's family for the reason of marriage. Number 2 - Hum Aapke Hain Kaun? This film is perhaps most famous for being 'the longest film of the decade', but don't worry, that doesn't take away any of its magic! Revolving around a large and lovable cast of characters the film is at number two in the top 10 Bollywood movies ever made because to me, it is what Bollywood is all about; Love, war, romance, heroes, villains, family and good old fashioned song and dance - all of which are integral parts to this film. On one the main characters - Rajesh, runs the family business and the film focuses on his families attempts to get him married but in doing so they end up finding him the love of his life. The story moves on to present a complicated set of family entanglements, politics and morals all of which are fascinating and touching to watch. A wonderful film and one of my favourites for sure. Also I forgot to mention the name; Hum Aapke Hain Kaun roughly translates and 'What/Who am I to you'. A very apt name once you have seen the film. Again - in my opion another very worthy entry into this list of the top 10 movies of all time. If you feel differently then please feel free to share your views. 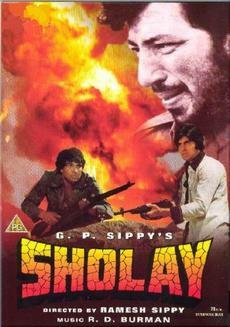 "The greatest star cast ever assembled.......The greatest story ever told"
Perhaps the most successful film ever produced in the history of the world, Sholay ran in the cinemas for a consecutive 286 weeks and was re-released several times in the 70s, 80s, 90s and again in 2005 after being issued the prestigious title of 'Film of the Millennium' in 1999. The plot has is base in the following line: A retired police officer, Thakura (Sanjeev Kumar) tries to convince two convicted criminals to head out and capture Gabbar Singh,the crime lord responsible for the massacre of Thakuras entire family and cut his hands off. The undercover criminals soon embark on an adventure which sees them both falling in love and the start (and end) of a bloody war between the two sides. A 'Captivating' entry into the top 10 Bollywood movies of all time I think you will agree! What bollywood films do you think should be added to this list? Do you have a great film you think should be on this list? If so then share it here but be sure to say why it is the best!